Hand Percussion. Browse All. Pocket Trumpets. Best Match. Our goal is to process all orders within 24 hours of receipt. This process may take 2 to 3 weeks. is Only Valid for Standard Ground Service to the lower 48 US states. Hand Percussion. Perfect for the working percussionist looking for a traditional sound and style, with modern construction features for a moderate price. Siam Oak shells with natural rawhide heads, 5 ?. The sound projects as well as full size bongos and can be played with sticks or hands. 7¼" and 85?. Hand Percussion. Our goal is to process all orders within 24 hours of receipt. Best Match. is Only Valid for Standard Ground Service to the lower 48 US states. 6" & 7" Traditional wooden bongo set Drum Key Tuning Lugs Finish: Natural. GREAT TONE. Real wood and hide. Totally tunable with a good, cutting sound - good value product. Includes tuning spanner. 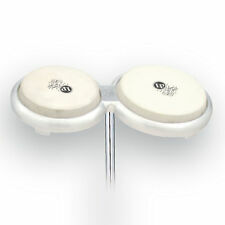 The new LP Compact Mounting System consists of a bracket that will enable the secure positioning of two Compact Congas. The unit can be used as a single compact conga mount and will adapt to various racks and stands. A real alternative! The NINO ABS Bongo Plus is an affordable bongo with a great sound and functional hardware. Shells made of ABS plastic make this bongo lighter than comparable wood models. Size: 6 1/2 and 7 1/2 Material: ABS Plastic Features: Hand selected buffalo heads Rounded rims for playing comfort Black powder coated hardware Outstanding tuning system in this price range Includes: Tuning key. Produttore :SOUNDSATION. La gamma di Percussioni SOUNDSATION è riuscita nel tempo a soddisfare le esigenze di una vasta utenza di percussionisti. Pelle Naturale. Rispondiamo a qualsiasi comunicazioneentro 24 h dalla ricezione. LP Generation II Bongos have a more pronounced shell contour than other bongos that creates crisp, distinct high tones. Hand Percussion. Browse All. Pocket Trumpets. Best Match. Our goal is to process all orders within 24 hours of receipt. 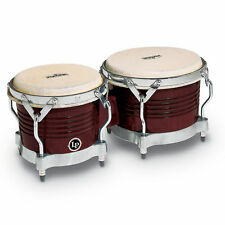 Belles Bongo tambours STANDARD TOBACCO macho et hembra tambours 6" et 7"
6" Macho und 7" Hembra. Durch leichtes Anziehen oder Lösen der Spannschrauben lässt sich die Klanghöhe der Bongos auf den persönlichen Geschmack anpassen. Ob für die spontane Profi-Session oder die Familienfeier im Garten: Lassen Sie sich von Kubanischen Klangwelten verzaubern! Marke SONOR. En dehors de la surface de la chaudière Mat naturel NM. Expédition à la Suisse n'est pas possible. Vous recevrez une facture incluant la TVA. Material: Rubber Wood. Helpful Links. Rockem Music accepts no responsibility for claims made after 48 hours. A cymbal will not be replaced if it has been: misplayed,used with improper sticks, dropped, played with excessive force or treated abusively; bought second hand or used in a lease program. WB200 WOOD BONGOS 6 3/4" MACHO & 8" HEMBRA These Wood Bongos are equipped with hand selected buffalo heads that produce sharp highs with warm tones, and are easily tunable. Rockem Music accepts no responsibility for claims made after 48 hours. Hand Percussion. 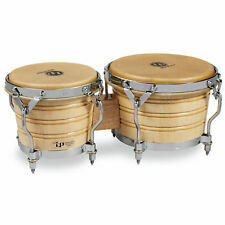 LP Aspire Wood Bongos are ideal for students and aspiring musicians. They provide great value at an affordable price. Siam Oak shells, Natural rawhide heads, LP Aspire EZ Curve rims and Cuban Style bottoms, 9?. Wood shells, Natural rawhide heads, Black powder-coated hardware, Traditional rims and Cuban Style bottoms, 1/4" tension rods, Size 6" and 7" bongos, Traditional Rims. Hand Percussion. Browse All. Best Match. Tambour Bongo 2 Pièces. - Tambour indispensable pour les débutants et les amateurs de batteurs. - Son épais et pur. - Matériel: bois et métal. This fine, bright design sets these bongos apart from the crowd of other drums on the market. Whether you are a beginner, a more experienced player or a pro, these bongos will delight you. The XDrum Bongos Pro provide authentic sound, stylish design and professional features at an insanely affordable price. Whether you are a beginner, a more experienced player or a pro, these bongos will delight you. The XDrum Bongos provide authentic sound, stylish design and professional features at an insanely affordable price. Tambour Bongo 2 Pièces. - Une bonne musique des jouets éducatifs pour vos enfants. Le forfait comprend. Durch das spezielle Stimmsystem, das ohne Bohrungen im Holz auskommt, können die XDrum Bongos ihren Sound voll entfalten. Die Felle werden über zwei Spannringe gestimmt, die bequem an der Unterseite justiert werden können. MPN FWB190LB. Couleur : Léopard Burl (LB). Sélectionné têtes en peau de buffle. Bois de caoutchouc: Matériel. The XDrum Bongos Pro provide authentic sound, stylish design and professional features at an insanely affordable price. This fine, bright design sets these bongos apart from the crowd of other drums on the market. Colour: Transparent. Rounded rims for playing comfort. Tuning key included. Colour: Wine Red Burst. Rockem Music accepts no responsibility for claims made after 48 hours. A cymbal will not be replaced if it has been: misplayed,used with improper sticks, dropped, played with excessive force or treated abusively; bought second hand or used in a lease program. RAPC (RADIAL PLY CONSTRUCTION) BONGO (DE PATENT) 6 3/4" & 8". Rockem Music accepts no responsibility for claims made after 48 hours. A cymbal will not be replaced if it has been: misplayed,used with improper sticks, dropped, played with excessive force or treated abusively; bought second hand or used in a lease program. Bongos DRAM, profesionales y elegantes. GB £ 25,00 Nordirland: BT, Kanalinseln Guernsey und Jersey: GY, JE, Äußere Hebriden: HS, Isle of Man: IM, Schottisches Hochland (Highlands) und Isle of Skye: IV, Orkney Inseln: KW, Shetland Inseln: ZE Firth of Clyde Inseln: KA27-28, Region Argyll and Bute mit Loch Lomond und Innere Hebriden: FK17-21, PA20-38, PA41-49, PA60-80, PH16-50, Isle of Wight: PO30-41, Isles of Scilly: TR21-25. Helpful Links. Rockem Music accepts no responsibility for claims made after 48 hours. A cymbal will not be replaced if it has been: misplayed,used with improper sticks, dropped, played with excessive force or treated abusively; bought second hand or used in a lease program. Shells: Wood. Rims and bottoms: Steel. Mounts & Hardware. Head: Rabbit skin. Key Features. Electronic Drum Kits. Drum Stools. Speaker Cabinets. Only the finest hand selected materials are used to produce this premium bongo which produces the authentic and typical loud slapping bongo sound. Zebra Finished Ash. Rockem Music accepts no responsibility for claims made after 48 hours. Bongo Professionnel Percussion Instrument A Main Traditionnel Gr 6,5 " 7,5 "
21473 / Type: 9 / Site: 186 / Modèle: 800. GB £ 25,00 Nordirland: BT, Kanalinseln Guernesey et Jersey: GY, JE, Äußere Hebriden: HS, île de Man: IM, Schottisches Hochland (Highlands) et île de Skye: IV, Orkney Inseln: KW, Shetland Inseln: ZE Firth of Clyde Inseln: KA27-28, région d'Argyll et Bute avec Loch Lomond et Innere Hebriden: FK17-21, PA20-38, PA41-49, PA60-80, PH16-50, île de Wight: PO30-41, Îles de Scilly: TR21-25. Tuneable heads with heavy duty fittings. Dark cherry wood finish. 7.5" & 8.5" heads. Practice Drum Kits. The XDrum Bongos Pro provide authentic sound, stylish design and professional features at an insanely affordable price. The shell of the XDrum Bongos Pro is coated with clear lacquer, which. This fine, bright design sets these bongos apart from the crowd of other drums on the market.